1. Lay four pieces of foil out on counter top or work table. Place two slices of tomato in center of each sheet, and season lightly with salt and pepper. Divide the Zucchini and Yellow Squash into four portions, and place over the top of tomatoes. Try to keep them as flat and evenly spread out as possible so they will cook evenly. 2. Season the vegetables with Italian seasoning. Use whatever seasoning blend you normally have in your pantry. If you prefer all basil, or have a blend you normally use, substitute here. You could replace with fresh basil leaves, but fresh herbs may be expensive depending on timing and market prices. 3. Place the Tilapia on top of the vegetable stack. Place 1 Tbsp butter on top of fish. If you soften butter slightly you can spread it easily over fish. 4. Season lightly with Salt and Pepper, and same seasoning you used on vegetables. Top with two slices of Lemon. Form a pouch with Foil and crimp edges, forming an envelope or bag. 6. Remove from oven and open foil; use caution as steam will be trapped in foil. 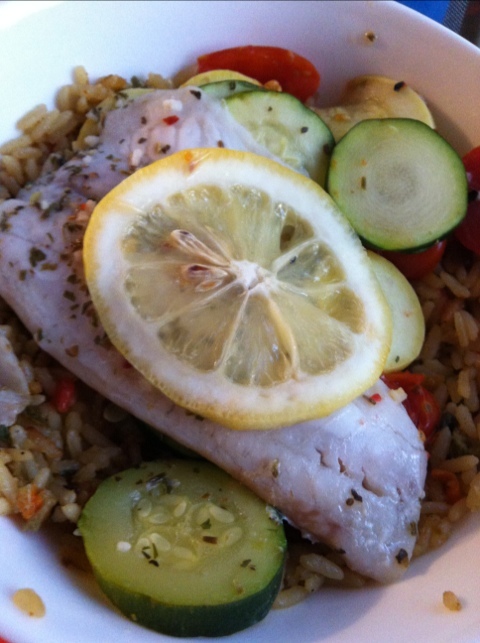 Serve the Tilapia and vegetables over cooked rice. 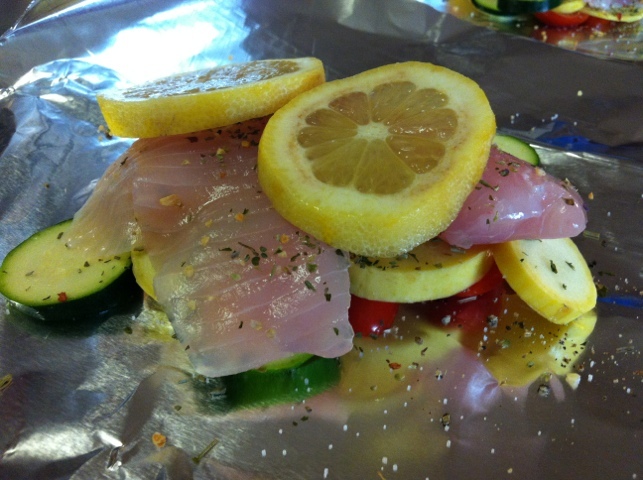 Make sure to spoon liquid from bottom of foil over top of the fish and vegetables. 7. You can substitute whatever side item you normally keep in your pantry, pasta, brown rice, couscous, etc. Enjoy! !